I walked around the beach for an hour to find where I wanted to paint. There were amazing views of cliffs and water, I decided on this view, however it was close to the water and there were no paved paths to it. 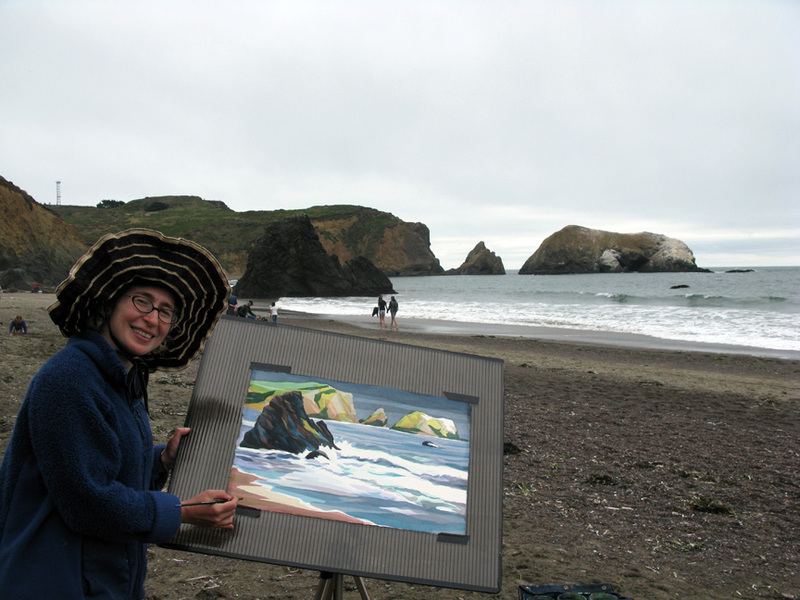 Steeling myself, I dragged my gear in a sandy beach for ten minutes to get to where I wanted to set up my easel. The tide came in, and the wind blew small droplets of ocean water in my face — I had to wipe off my glasses from the sea salt formation once every half an hour. I do not use any water resistant material to keep the white color of the paper; nor do I use opaque white to cover up the paint, it is never as white as the paper. I had to decide from the early stages of the painting where I wanted my whitecaps to appear on the painting, and carefully paint around them. San Francisco, California. July 2014. Framed 35” x 29”. ♥ Juried into Emerald Art Center Annual show 2015, Portland, Oregon.